Romanat is a village 8 kilometers north of Mek’ele in the Tigray Tegion of Ethiopia. Roman Falls provides a pastoral oasis where family and friends gather to enjoy its bounty.  It is in the spirit of Romanat Falls, coming together to share and enjoy, that Cafe Romanat was conceived. 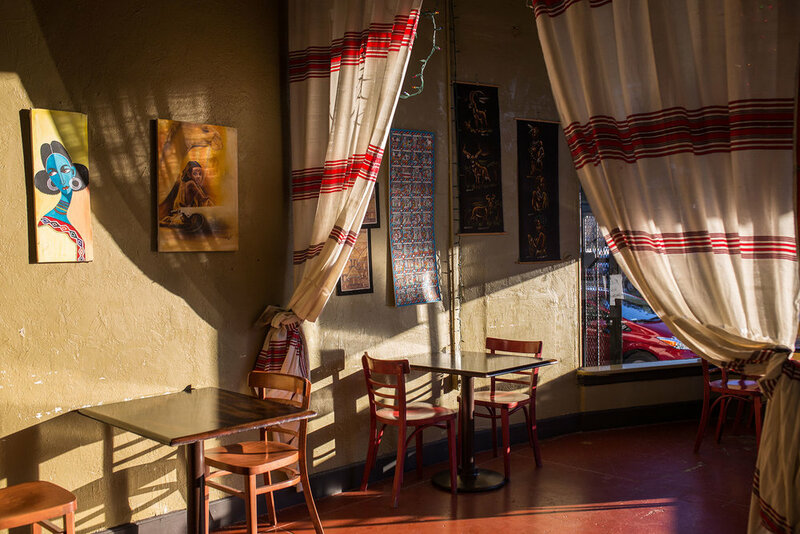 We strive to offer not only what is unique and wonderful about Ethiopian food, but also what is friendly and inviting about Ethiopian culture. A place for family, friends and sharing. Dishes served family style; meat & veggies can be separated upon request. All dishes are served with Enjera, a traditional sourdough flatbread, & a side salad & Buticha. Gluten Free Enjera available, +$2 per person. Served over Enjera with salat & buticha. Brewed by first roasting the green beens over hot coals in a brazier, once beans are roasted, each participant is given an opportunity to sample the aromatic smoke by wafting toward them. This is followed by the grinding of the beans and then put into a special vessel and boiled. To pour the coffee from the boiling pot, a filter made from horsehair or other material is placed in the spout of the boiling pot to prevent the grounds from escaping. Reservations Required • 2 - 8 Guests • 30 Minute Duration. 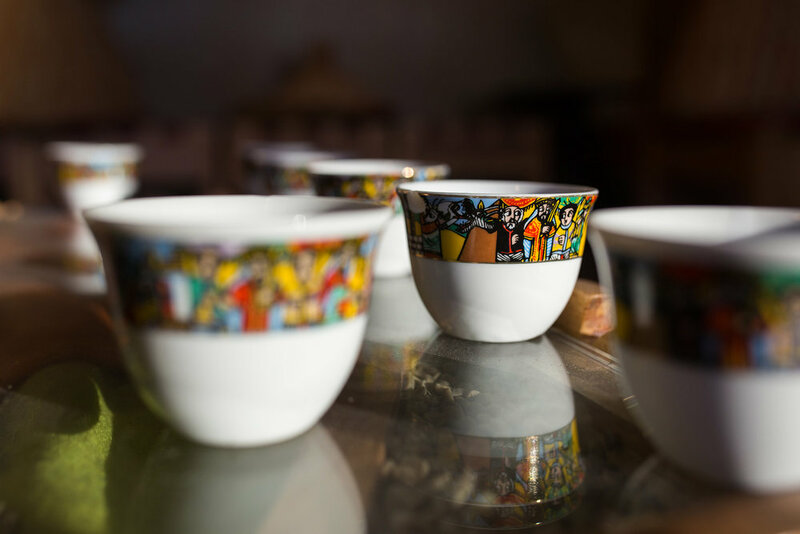 A unique & delightful coffee experience that captures the traditional preparation, aromatics, & essence of Ethiopian coffee. Green coffee beans are freshly roasted, creating an aromatic smoke to be enjoyed. The bean is freshly ground, & brewed in a Jebena, a traditional ceramic vessel, over hot coals in a brazier. Bring the taste of Ethiopia home with pick up via Eat 24 or delivery with Caviar. Place an order to be picked–up by calling us at (510) 444–1800 or with EAT 24. Enjoy Ethiopian cuisine from the comfort of your own home with delivery service from our partners at Caviar. You may use a long list of delivery providers but our relationship with Caviar will ensure the best service and support with your order.